138 pages | 37 B/W Illus. This book provides a comprehensive and critical overview of learning accounting. It illustrates that when learners need to mentally integrate two or more distinct items of information, it places unnecessary demands on cognitive load. The book discusses the cognitive load theory, which assumes that the task of mental integration increases the load on already limited working memory, and it does so to such an extent that learning may be severely impeded. 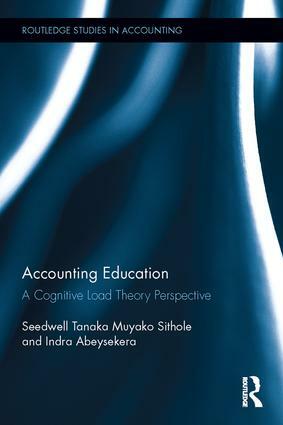 The book also investigates how students could deal with cognitive overload when learning introductory accounting using three instructional design formats: the split-attention format, the integrated format, and the self-managed format. Seedwell Tanaka Muyako Sithole is Lecturer at the School of Business at the Western Sydney University, Australia. He holds a PhD in Accounting, and his areas of expertise lie in financial accounting, accounting education, and financial reporting and regulation. He lectures in accounting and finance at both the undergraduate and postgraduate levels. Indra Abeysekera is Professor in Accounting and Dean of DBA at the S. P. Jain School of Global Management in Sydney, Australia. He is a skilled and committed accounting academic and research leader with expertise in financial accounting. He has an outstanding track record in the accounting discipline, having published five peer-reviewed research books and more than 100 articles.